Stylish, sturdy and sensible, the PetSafe(r) Panel Pet Door Insert(tm) is a smart choice when shopping for pet doors. This pet door is a cut above the rest for several reasons. First of all, it has a paint-ready and raised mould design that is easy to customize and will complement any home. Secondly, the pet door has strong, yet flexible, vinyl flaps which feature internal strengthening ribs that will endure constant use. Also, the PetSafe(r) Panel Pet Door Insert(tm) is full of options. Upon installation, you have the option to choose either 8" or 10 1/2" rise height. You have the option to adjust the hinge plates and vinyl flaps if your pet's needs or weather changes require adjustments. You also have the option to limit access to your pet through use of the included plastic snap-on closing panel. Finally, the PetSafe Panel Pet Door Insert(tm) is easy to install and comes with a helpful Homeowner's Guide. Easy Installation - We've done the hard work for you! Standard 23" x 26 1/4" panel frame cutout, 8" or 10 1/2" pre-calculated rise options, mated bosses for perfect alignment and hardware with finishing plugs. Installation Guide is included. Paint-Ready and Raised Mould Design - Color and design are the most powerful ways to change and coordinate the look and feel of a home. And now, PetSafe(r) Panel Pet Door Insert(tm) is designer ready for even the most stylish homeowner and their pet. It's all about integrating your beautiful home with your lifestyle. Flexible Vinyl Flaps - All PetSafe(r) flexible vinyl flaps are tinted and have high-quality UV inhibitors added for lasting sun protection to resist fading, cracking, and hardening. Softness of the vinyl flap and precise placement of magnets creates a natural motion when your pet steps through the PetSafe(r) Panel Pet Door Insert(tm). Internal Strengthening Ribs - Diagonal cross-sectional ribs and triangle reinforcements add strength for superior craftsmanship and everyday pet use. The PetSafe(r) Panel Pet Door Insert(tm) is designed to provide long lasting performance and satisfaction. No rotting, twisting, cracking or warping. 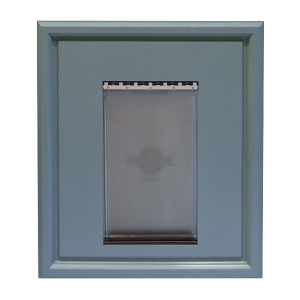 Outer-Frame Weather Proof Design - The outer panel edges of the PetSafe(r) Panel Pet Door Insert(tm) is pre-beaded from the factory with Butyl sealant. The sealant creates a tight seal to resist water leakage and the effect of extreme environmental temperatures to protect the core of the homeowner's door. and water damage from leaking into the core of the homeowner's door. Dual-Rise Options - The innovative design of the PetSafe(r) Panel Pet Door Insert(tm) makes it possible to flip the pet door for an 8" or 10 1/2" rise option. During installation, opt for either height and easily assemble using our T-guide and groove design. Customize for short and tall pets, made simple in one pet door insert!. Removable Dual-Flap Mount and Adjustable Hinge Plates - Easily unscrew and slide out the dual-flap mount to expose two adjustable hinge plates for installing the right rise option or replacing flaps. Vinyl flaps shrink during cold months and stretch in warmer months and our flaps can be adjusted quickly to ensure a snug fit during seasonal changes. Continuous use will not break or restrain inward or outward movement as strength and durability are built into the fluid motion behind the hinge plates. Closing Panel - Included with the PetSafe(r) Panel Pet Door Insert(tm) is a plastic snap-on closing panel. Convenient, for those times when limiting access for your pet's entry and exit is necessary. Homeowner's Guide - Attached to the inside of every closing panel is a helpful Homeowner's Guide. The guide provides ways to maintain the PetSafe(r) Panel Pet Door Insert(tm) with instructions to adjust flap, replacement part numbers, warranty information, how to contact the PetSafe(r) world-class Customer Care Center and much more.